The payment is completed within 15 minutes. If you chose Profile type → Legal entity whenregistering in Toloka, the bank card must be corporate. The money transfer period is from 3 to 10 days. When making a transfer, specify the invoice number in the payment reference. You will be redirected to the PayPal site to complete the payment. The full list can be found at USA Department of the Treasury. On the Profile page, click Connect to billing. Check your details and click Connect. Note. This information will be included in accounting documents (service invoices). Click the Transfer funds, enter the transfer amount and click Transfer. You will be redirected to the Yandex.Balance service. Restriction. The minimum transfer amount is 10 dollars. In the Payment method section, choose one of the options. To return to choosing a payment method and changing the payer's details, click Change payer or payment method. To quit the payment process and return to Toloka, click Back to - Yandex.Toloka in the top-right part of the Yandex.Balance page. 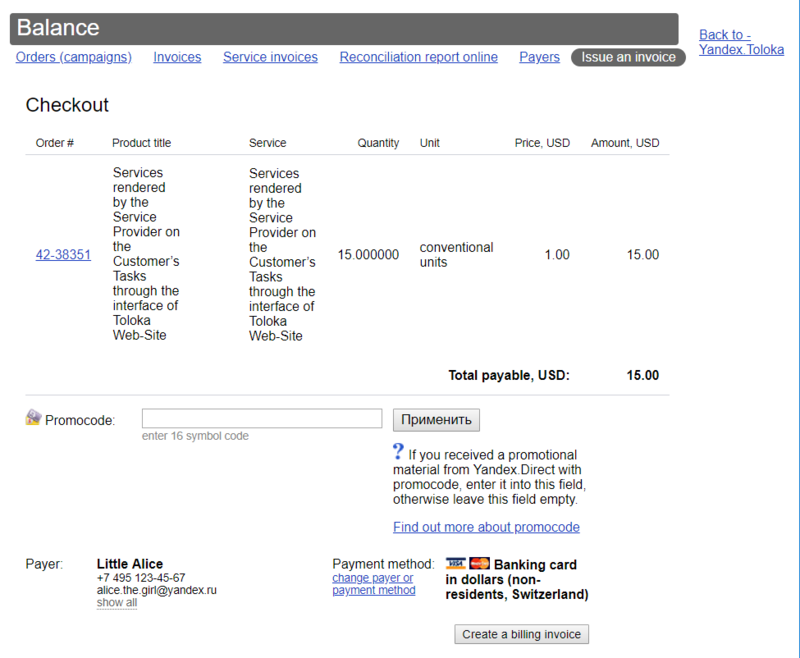 Then click the Create a billing invoice button. If you chose Payment method → Bank deposit in US dollars for non-resident individuals (Switzerland), you will receive an invoice with payment details. If you chose Payment method → PayPal for individuals, you will be redirected to the PayPal site for payment. If you chose Payment method → Banking card in dollars – non residents Switzerland) – US dollars, enter your bank card information and complete the payment. The money will be converted at your bank's rate if the card currency is not dollars. Note. If you use the Yandex.Money wallet, you may be asked to enter the payment password when you go to payment. On the Profile page in Yandex.Toloka (the Transactions history tab). If the money didn't come to the account within the specified period, contact the support service.